Also 15 days in jail, seven months of probation, 100 hours of community service, an apology letter, anger-management classes and mental-health counseling, but the day of taunting is the amusing part. 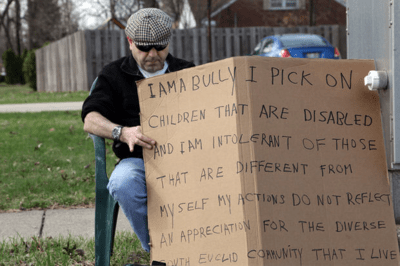 The Cleveland Plain Dealer reported that Edmond Aviv was sentenced to hold the "I AM A BULLY" sign after he pleaded no contest to a charge of disorderly conduct. Aviv has allegedly been harassing his next-door neighbor, Sandra Prugh, and her family for the past 15 years, and this is the fourth time he has been convicted of it. According to this report, the Prughs have seven children, three of whom are disabled. Two of the latter are African-American children the Prughs adopted. Mr. Prugh now suffers from dementia. With burdens like that, it's great to have a neighbor who yells racial slurs at your children, calls you "monkey mama," and smears dog feces on the kids' wheelchair ramp. Among other things. Police witnessed at least one of Aviv's acts, after Prugh called them to report kerosene fumes coming from his garage. Police found he had built a device with a fan that blew the fumes onto Prugh's property. The Plain Dealer quoted another neighbor who said Aviv had yelled racial slurs at him while he was growing up. "This punishment is great," he said. "Justice has been served." In his letter, Aviv told Prugh that "I want to express my sincere apology for acting irrationally towards your house and the safety of your children." On Sunday, of course, he denied everything, and said his sentence wasn't fair. "I didn't do this," Aviv said to a reporter who asked if he was sorry. As he spoke, someone in a passing car yelled: "Douche bag!" Maybe not the worst neighbor ever, but probably on the short list.